This absolutely stunning salad arrived in my kitchen via Heidi’s gorgeous blog. I have been following food blogs for a really long time now (my favorites are over there on the right), and what makes Heidi’s so inspiring is her down-to-earth approach to whole-grain, all-natural cooking. Her poetic, tactile prose accompanies pictures so beautiful, they sweep you up in a heady whirlwind, making you almost forget her recipes are also healthy and good for you. Many of my favorite bloggers post regularly about delicious and rather decadent-looking things, and while I may bookmark them for a special occasion, they will rarely get me rushing to the kitchen. After all, I can barely be trusted with a jar of nutella, do I really look like I should be making this, and having it sitting on my counter looking cute? I don’t think so. Also, I happen to be married to the most disciplined man when it comes to sweets. He’ll have a sliver so small with his morning coffee, it would make those nutritionists at Cooking Light proud; you know, the ones who claim a serving of a moist chocolate triple layer cake contains a measely 230 calories. Exciting, I know, until you realize that they’ve divided up the cake into 30 slices. And then, to add insult to injury, he’ll go about the rest of the day as if there aren’t 29 servings left, not giving the cake so much as another thought until the next morning arrives, with its promise of a fresh cup of coffee. I, on the other hand, have to use all of my willpower to keep that cake out of my mind. And trust me, out of sight just doesn’t cut it. Which brings us to Heidi and her Big Bowls and her Soups and her Salads. They’re healthy, and wholesome, and they are just want you want for lunch. And if you come back for seconds, they probably really will have 230 calories. Not that we’re counting. And now, without further ado, the star of this event: Brown Rice meets Glorious Lettuce meets Citrus Parmesan Dressing. 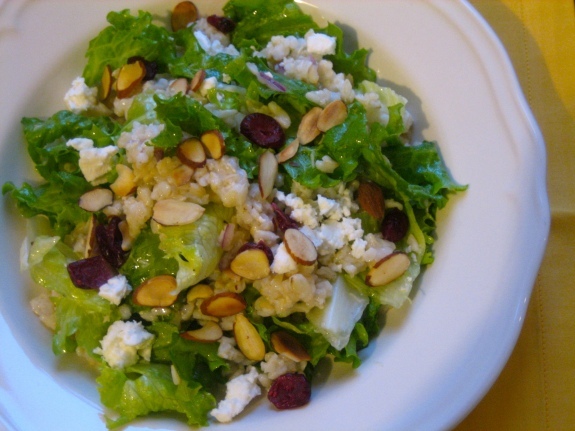 I really doubt you need more incentive to make this salad, but if you do, here goes: the 1:1 ratio of rice to lettuce makes this light and bright, and the salad, which gets doused with a citrus parmesan dressing (whose name is an incentive in itself) and sprinkled with feta, almonds and dried cranberries, emerges as that often elusive perfect balance of healthy, delicious, earthy and sophisticated. It’s really easy to play with the quantities here; the idea is to get a 1:1 ratio of lettuce to rice. 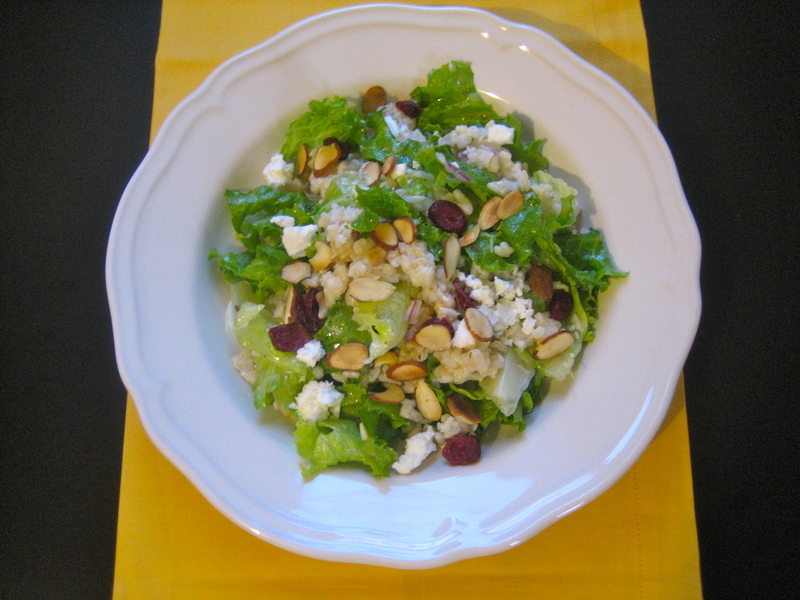 You can always make the dressing as it is, and keep it in a jar for other uses, and make as much you want of the salad, keeping the proportion of lettuce and rice, and sprinkling on however much feta/almonds/dried cranberries you’d like. 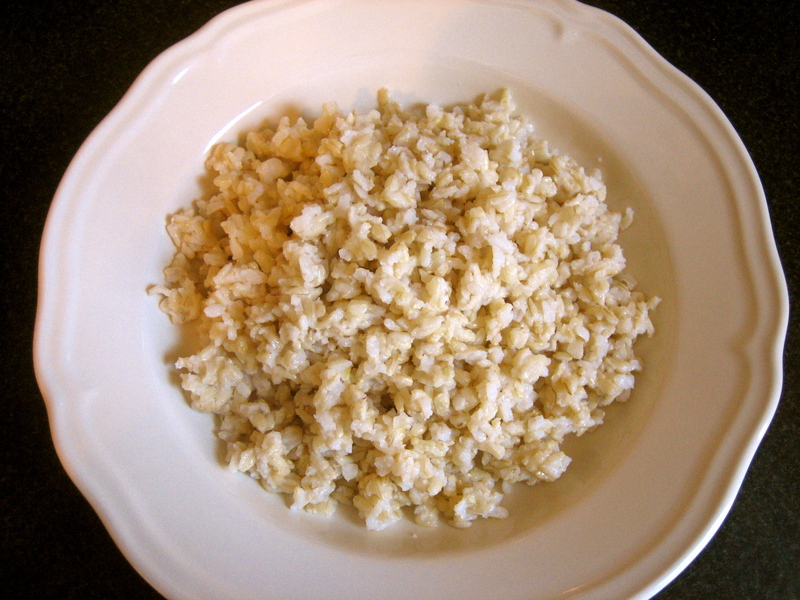 This would also be a wonderful way to use up leftover rice. 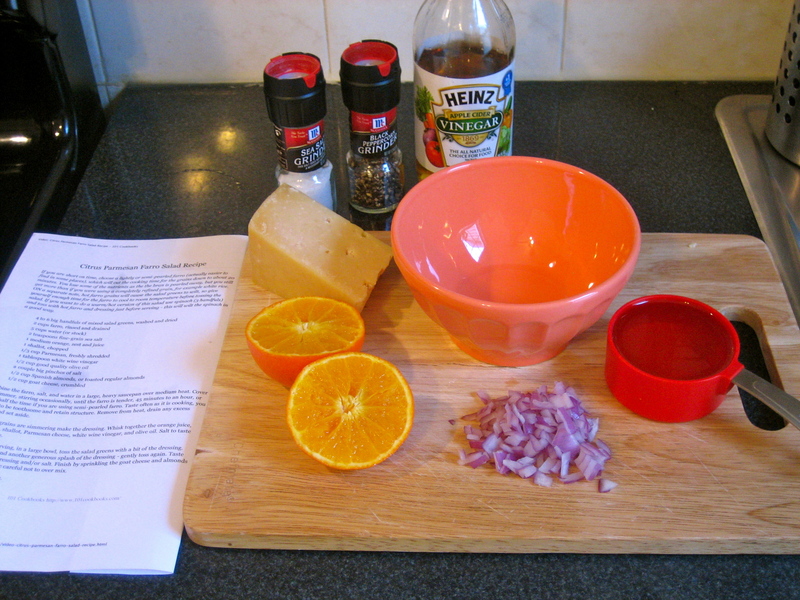 Whisk together all of the dressing ingredients, and add salt and pepper to taste. Set aside. 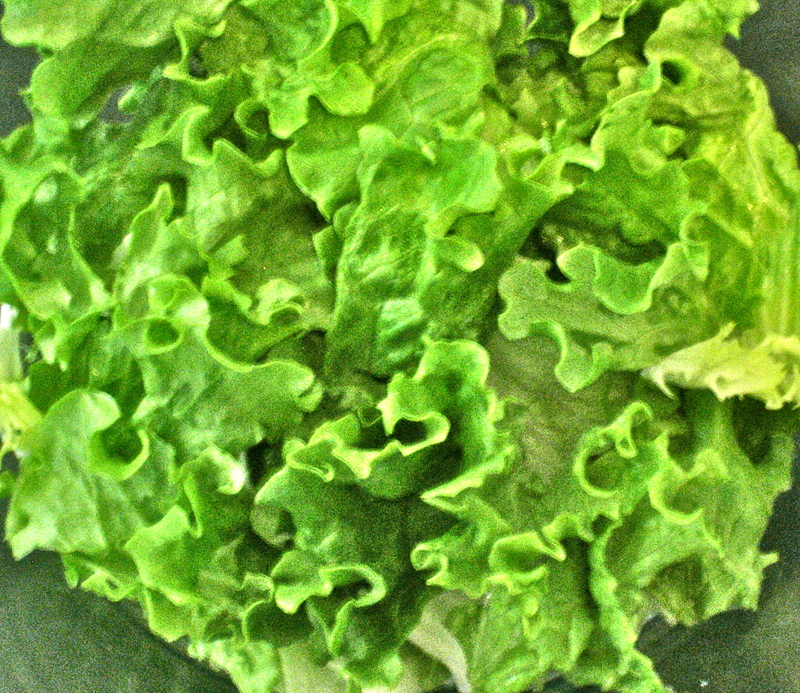 Toss the lettuce with a little bit of the dressing, add the brown rice, then add more of the dressing, and toss gently. Taste and add more dressing and/or salt. 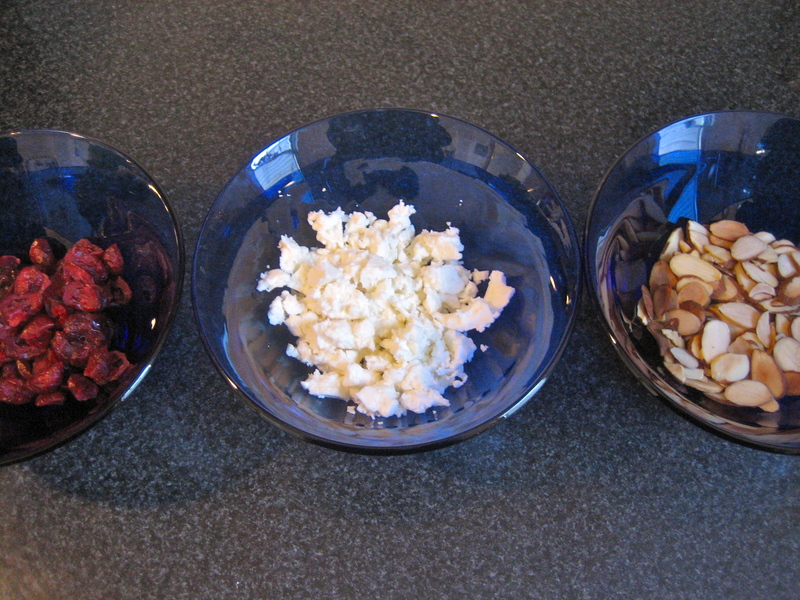 Sprinkle with the goat cheese, almonds and dried cranberries. You’re done. I have it and even made something from it already, but I am just dying waiting to see what favorite recipes people post on the library. I think it’s because I literally don’t know where to begin, I need someone else to have a favorite to share with me! I hope you get your copy soon!!! What did you make? I think the Baked Oatmeal on Lottie and Doof sounds delicious as well as the Quinoa Patties on Seven Spoons… I’ll let you know as soon as I receive mine and make something from it ;) I have a feeling Heidi’s newest will get more of a workout in my kitchen than the Rose Bakery Cookbook- I still haven’t cooked anything from it! I even have leftover quinoa sitting in my fridge right now, maybe I’ll make those patties tomorrow! Congrats on the Blog. Lucie is from Lucette, the name I used in French class in high school. I love your pictures. Keep it up. Especially the personalized bits, like the Hebrew newspapers with your Grapefruit Brulee. this looks so good! i can’t wait for you to make it for me…You must have one lucky husband!